When the Nationals signed Cuban defector Yunesky Maya in July, we thought we were getting a seasoned international competitor, a professional pitcher who would be the next in a good line of comrades who have made an impact in the majors. After watching and commenting on his MLB debut, I was impressed. Maya wasn’t overpowering but showed a great variety of pitches and a fearlessness on the mound. However, his fourth start yesterday (box/gamer) demonstrated the same issue that plagued him in his first three starts; the big inning. In each start now, he’s had one bad inning amongst several good ones. Yesterday he was unlucky to give up an unearned run in the 3rd, but then gave up 4 runs in the 6th and was yanked. The crushing blow was a no-doubter homer from Atlanta’s shortstop Alex Gonzalez on a first pitch hanging curveball. Suddenly the Nats are down 5-0 and have given up 4 runs in an inning, a relatively insurmountable score because of the “big bang” theory of baseball scores (see this Boswell chat for more details, but analysis of box scores over the years shows that in more than half of baseball games, the winning team scores more runs in ONE inning than the losers score the entire game). This is why these big innings are troubling. You give up 3 or 4 runs in an inning with an offensively challenged team like the Nats (playing yesterday without Espinosa, Zimmerman, and without original #5 hitter Willingham) are almost always going to lose. Sure enough, Derek Lowe shut them down for 6 relatively innocuous innings and the Nats never scored at all. I was at the game yesterday, which makes analysis of Maya’s stuff rather difficult. All we can see is the mph on the pitch to guess whether it was a fastball, curve or change. Maya didn’t seem to be throwing hard (averaging 88-89, maxing out 91 or so per yesterday’s pitch f/x data), and certainly wasn’t getting strikeouts (1 K in 25 batters faced, not even getting his counterpart on strikes). His pitching coach was interviewed though and commented that Maya has found MLB hitters to be far more patient than in Cuba or International competitions, and that MLB umpires are not giving him pitches on the corners. He seems to be nibbling, not throwing strikes or trusting his stuff. It also goes without saying that he is still in early season/spring training mode, having only made his professional debut for us on August 13th. Still, it is hard not to be concerned about his performance thus far. Did we waste $6M on him? Side note about the unearned run in the 3rd: Gonzalez made a fantastic diving stop with guys on 1st and 2nd and 2 outs, only to see Kennedy failing to cover 2nd base for the easy force out. Possibly a mental error but more likely a result of the exaggerated pull shift the Nats employed on Atlanta’s catcher McCann. So he forced a throw to first from his knees that short-hopped Dunn. Dunn ineptly missed the throw, it got by him and a run scored. This error was then attributed to Gonzalez, who gets penalized AFTER making a great play and to try to make up for his teammate’s mental error. A better first baseman makes that play easily. This is just another example of how unfair our basic fielding stats are these days and how you just can’t measure some things in a box score. On the same play, as the ball was getting past Dunn, the Atlanta runner running from first (Heyward) blew through the stop sign and was thrown out by 20 feet …. so he did what came naturally to major leaguer,s recently; he tried to bowl over our catcher (Ramos) instead of sliding or giving himself up. Ramos pulled an “ole” move, kinda dodging the collision attempt and getting the tag in. I realize that in some cases a catcher blocking the plate gives the runner little choice but to try to dislodge the ball by barreling into the opposing player. But on a play like this I think the choice to try to deliberately harm the catcher needs some league retribution. Heyward, to his credit immediately apologized to Ramos for his decision, which probably prevented further retribution. Lastly, read this nugget in Nats News Network, where Riggleman has said that Olsen takes too long to warm up and thus can’t really be used out of the bullpen. In other words, be prepared for a non-tender on December 1st. 9/25/10 Draft “race” update: #7 pick awaits. Washington’s recent 4 game winning streak, including 3 of 4 from Houston, has probably taken them out of the race for the #3 pick. As it stands, we have the #7 overall pick, just behind Arizona’s compensation pick. They now sit 3 games “behind” for the #6 pick and 3 games “ahead” for the #8 pick. In the 11-14 spots are the high-payroll failures from the 2010 season; LA Dodgers, LA Angels and NY Mets (though the biggest payroll failure this year has to be the Chicago Cubs). 1. I’ve tired of the spam comments that are popping up on the site, so i’ve changed the commenting behavior to force you to have to log in to comment. Apologies but that’s the way it has to be. 2. I’ve started a new gig and haven’t really had time to post or update some of my tracking spreadsheets. I’m working on some post-minor league season reviews by affiliate and should start posting those soon. While attending a fantasy football draft, I missed the melee from last night. But certainly I was not surprised to hear that Nyjer Morgan was in the middle of it. Borrowing from an email conversation between friends Jamos and Droopy this morning, here’s some point by point thoughts on all of Morgan’s various transgressions lately. 1) Nyjer shouldn’t have gotten into it with the Phillies fans. (isn’t anything involving the words “tauning” and “Philadelphia sports fans” always going to end in disaster?). Fans are antagonizers, and drunken late-inning fans close to the field who are purposely talking to the players are only looking for a reaction. 3) Nyjer needs to keep his trap shut to the Media when asked about batting 8th and being sat by his manager. Riggleman is old school and rightly sat Morgan so he wouldn’t get a ball in his ear from Wainwright after the questionable behaviors the previous night. As for batting eighth … well Nyjer, when you have an OPS+ of 72 and a puny OBP of only .317 on the season, you can’t really complain when you’re put in the 8th spot can you? How about you perform to your 2009 levels (OPS+ of 121, .396 OBP) and let your bat do the talking? 4) Nyjer should have slid into home against the Marlins, but you can’t fault him for what he did. As Riggleman was quoted in the post-game, it is incredibly hard to 2nd guess sliding versus body blocking at home plate. You’re trying to get a read on the catcher’s body language and his positioning as you’re racing down the base-path to try to score the winning run. You’re certainly NOT saying to yourself, “Hey I really want to hit this guy how can I do it?” Nyjer made the decision that a collision was going to give him the best chance to score the run. Riggleman supported him there. It certainly wasn’t nearly as questionable a play as the Utley-Flores incident that essentially took out Flores for a season and a half. The fact that Florida’s catcher suffered a season-ending injury is tough though, which led to the next point. 5) I don’t fault the Marlins for throwing at him—however, you’ve got to do it in his FIRST at-bat. You don’t wait until the fourth inning when you’re up 14-3 or whatever to throw at him. Florida could not have been more obvious about what they were doing. The SECOND time you throw at a player? That pitcher and coach should be fined and suspended. 6) I don’t think Morgan’s stealing falls into the realm of baseball’s “Unwritten Rules.” Yes, it was a blowout at the time, but the Marlins had their closer in the game in the 8th inning, as Zimmerman pointed out. And by the way, the whole “you don’t steal when you’re up by 10 runs” never applies to the LOSING team. Whoever said that Morgan was showing them up was just looking to stir up trouble. 7) Lastly, I’m ok with Nyjer rushing the mound after getting a ball thrown behind him in his third at-bat. Agree wholeheartedly; the first time you get hit is payback. The 2nd time is an attempt to damage a player’s career. I’d support the charging of the mound and if i’m a vet on the Nats i’m going out there for blood. Noooooow. All that being said. Nyjer Morgan’s performance this year, his lapses in judgment in the field and on the base-paths, and certainly his severe lapses in judgment in the past two weeks says to me that his usefulness to this franchise has reached an endpoint. Rizzo has gone out of his way to rid the team of clubhouse lawyers, cancers, non-hustlers and problem children. I think a 2011 outfield of Willingham, Bernadina, Morse with Maxwell as a backup is quite serviceable for the short term (without considering any FA pickups, which are a possibility in the OF in the off season). Perhaps by 2012 we’ll have Michael Burgess or (hold your breath) Bryce Harper ready to take the field. Perhaps the Nats go after someone like Jayson Werth and keep Morse as a super-sub. In any case, the only reason to hang on to Morgan right now is if Rizzo was saving face and holding on to one of the key members of the 4-player deal with Pittsburgh. Well, Adam Kilgore beat me to the punch on this post earlier today, but I’ll still post my sentiments. Scott Olsen put in yet another forgettable performance last night (gamer/box), lasting only 5 outs while giving up NINE earned runs in an ugly outing. His era rose from 4.91 to 5.88, his whip rose from 1.43 to 1.53 and his ERA+ dropped from an already mediocre 84 to 70. He drops to 3-8 on the season and the team is 5-10 in his starts. The problem with Olsen is that his “highs” are not balancing out the lows. In 15 starts he’s pitched into the 7th inning twice (including one gem against Atlanta where he gave up 2 hits in 7 1/3 inning) but he’s had “meltdown” games no less than five times. (“meltdown” being defined as a game where the pitcher gives up at least as many runs as innings pitched). Olsen arrived to the team with a history and a less-than-stellar fitness routine (he was a half-a-pack a day smoker). We havn’t heard a single peep about any attitude or smoking issues this year and I was impressed that he accepted last year’s non-tender and subsequently signed on for less than what he would have earned in arbitration to start the season. I’m less impressed with the results for this team. Thankfully for Olsen, he won’t earn an outright release in the next few weeks, probably just getting sent to the bullpen or just shelved as Yunesky Maya gets called up to naturally make the 9/7 start on a normal 4 days rest. But, with an expected crowded race for next year’s rotation, he’s quickly earning himself a non-tender after the season is over. Did Chapman really throw a ball 105mph? (Editor’s Note: Originally published on 9/2/2010, edited several times since, including links to the 105.1 pitch later in 2010 and him hitting 105.1 again in 2016). 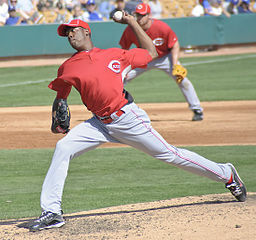 If you believe twitter and these published reports, Cincinnati’s Cuban prospect Aroldis Chapman “sat” at 103 and hit 105mph in his final AAA appearance before getting called up for the 9/1/2010 roster expansion. I had a hard time believing it; the picture in the Yahoo looks doctored frankly, and stadium guns are notoriously “jacked up” to get the crowds excited and to spark interest in hard throwers. There are two kinds of radar guns used by stadiums and scouts today. A “fast” gun measures the speed of the pitch as it leaves the hand of the hurler while a “slow” gun measures its speed by the time the pitch crosses the plate. For obvious reasons you’ll take the “fast” reading if you’re trying to hype the player, and you take the “slow” reading if you’re trying to evaluate the pitcher. Oh, and you take readings over and again, compare first inning to last inning, etc. My thoughts were that Chapman was on a fast gun that was over-exaggerated to add a couple MPHs (case in point; Jordan Zimmermann‘s radar readings on the telecast two nights ago put him at 96mph when his pitch f/x maximum was 94). However, look at the data from 9/1/10. He threw 7 fastballs that AVERAGED 102.11 mph with a peak of 103.9mph. 103.9!! Now, I know there’s a ton of links out there talking about what the fastest ever reported pitch is on record (see links here or here at HardBalltimes or this google cache’d document as well as wikipedia or Guinness Book of World records links). Nolan Ryan‘s “record” of 100.9mph has stood as some sort of altar to the speed ratings for years and years. You’ll see radar gun readings as evidence that various players have thrown the ball 102, 104, whatever. Steve Dalkowski and Bob Feller being “recorded” using primitive measures in the 107 or 110 range. Walter Johnson was known for his power in the early part of the century; his fastball was estimated to be in the upper 90s. Its a shame that modern technology didn’t exist back then. (Side Note: if you’ve never heard of Dalkowski … his wikipedia page is a pretty good read). Other rumors and records for fast pitches suffer from perhaps hype and estimates, not science. Zumaya reportedly hit 104.8 in the first game of the 2006 ALCS, but it was on the stadium gun, not Pitch F/X. Ryan and Goose Gossage both reportedly hit 103mph in the 1978 All-Star game. Stephen Strasburg reportedly could hit 102 as an amateur but rarely goes about 97 post-arm injury. Justin Verlander may not have the triple-digit records but amazingly maintains his upper-90s throughout games, often hitting 100mph in his last inning of work. I think Chapman’s speed last night is the new standard. And a pretty amazing accomplishment. (Editors notes: Chapman set a new MLB record on 9/24/10, after this article’s initial posting, throwing a documented 105.1mph. He also threw a ball at 104.6 on 7/28/14. Not quite as fast as his best ever … which I’m guessing even Chapman doesn’t think he’ll ever beat, since he got the reading tattooed on his wrist. Then on 7/19/16, years after his first record, he tied it again, throwing another ball 105.1. Here’s the StatCast link for this pitch. Post-posting related link: BA’s J.J. Cooper posted this Q&A session on 4/28/15 talking about Chapman and 101+ MPH pitches. Jan 2017: Boston pitching prospect Michael Kopech, who is renowned his velocity, hit 110 MPH during a “max velocity” workout early in spring training. Holy mackerel! How long before this kid gets to the majors and has a gun on him?? May 2018: we may have a new gold standard; Jordan Hicks threw a reported 105.1 MPH fastball, but Pitch FX shows it at 106.1. Wow. I guess it was just a matter of time before someone broke Chapman’s record. At the risk of sounding TOO optimistic (like perhaps the ever rosy Thomas Boswell in today’s WP column), Jordan Zimmermann looked awfully good last night in his 2nd start back (gamer and box score from nationals.com). He went 6 complete innings, gave up 1 hit (a double by Sanchez that was erased on a great outfield assist from Bernadina), struck out 9 and finished on 86 pitches before being lifted. He could have gone more, but why would you at this point in the season with a guy coming back from injury? Zimmermann’s effort is probably the 2nd best/2nd most dominant pitching performance of the year (behind Strasburg‘s 14k debut 6/8/10) from any Nats starter. Per the pitch f/x data he hit 94 once, touched 93 a few times and averaged 91.79 on his 65 fastballs on the night. (side note; just goes to show you can NOT trust the stadium Guns, ever, as they had Zimmermann on 96 in the first inning several times, which means that the stadium gun was at least 3mph faster than reality). It is hard to gauge the breakdown of pitches though; per the f/x data he only threw one changeup, yet was quoted in the gamer as saying that his changeup felt great. I’m guessing that some of the pitches classified as “sliders” were in reality changeups, and that the variation of speeds between his slider and curve screwed up the pitch classification. Either way, his curve was definitely faster and less loopy than his previous start. By pounding so many fastballs he showed that he has dominant enough stuff to challenge a pretty decent hitting Marlins team. Zero walks and 86 pitches to finish 6 innings means he had pretty good control. Unless the Nats are specifically NOT calling changeups after what happened to Strasburg? That’d be a bad precedent. On the season, Zimmermann now has 13ks and 1 walk in 10 innings. That’s something to build on. I’ve always thought that best-case Zimmermann had the capabilities to be a great #2 starter on a good team, and performances like last night are indicitave of that and much more.